Adding to the list of trends which I wish I got into early (along with Jazzercise), let me present some information on Bitcoin. A more in-depth venture into the world of Bitcoin, a Joe Rogan Experience interview with Andreas M. Antonopoulos..
As per the idea of Bitcoin mining… before you get yourself worked up as I initially did, know that there really isn’t a place in mining for you. It takes too much energy to eek out the currency, and those who are doing it are doing it BIG. In the above video Antonopoulos calls this a modern day arms race. 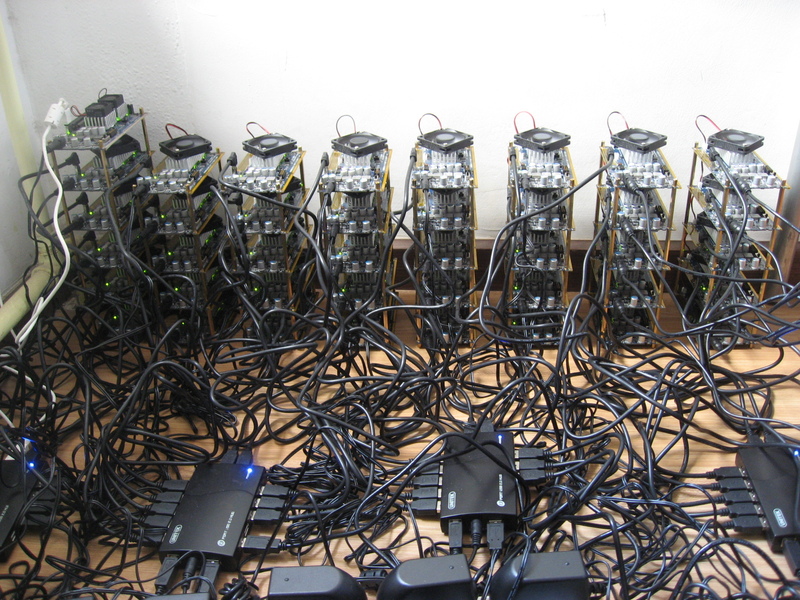 Below is a photo of such a Bitcoin mining system, and beneath that an article on the big miners. An article which talks about the lengths which people are going with Application-specific integrated circuit systems for mining. The inventor of Bitcoin, a person (or group…) by the pseudonym of Satoshi Nakamoto released this paper which explains Bitcoin. If you’re really interested in getting in the know, I would advise reading this. This entry was posted in 2014, Bitcoin, Economy, Joe Rogan and tagged Andreas M. Antonopoulos, Application-specific integrated circuit, ASIC, Bitcoin, joe rogan, joe rogan experience, Satoshi Nakamoto. Bookmark the permalink.